The band Tribuh officially appeared on June 1, 2013, in Belém, Pará, Brazil. At first, was just a solo project of the leader and guitarist, LeArzzi, and gradually gained its own life. What would be a single CD with instrumental songs focused on the drums and shared with friends in social networks, hás become something huge: the band TRIBUH. During the process of composing the CD the drummer decided that there would be many musical styles, including his favorite one, thrash metal. Thus, the first song was a powerful thrash that asked for a solo guitar, and for this was requested the help of a college friend and guitarist called Pequeno. Immediately hooked by the potential of this material, the guitar man felt the strength of that project and asked to accompany the drummer in live performances. Although concerts were not part of the plans in that moment, the drummer was intrigued and excited about the possibility and soon create another song following the same style, which gained immediate approval of the guitar man. Thus came the idea to forming the band to release this material. Throughout the process of creating the album, the drummer decided to drop the drumsticks and look for new challenges, so he assumed the voices and the guitar base of the band. Months later the duo composed the first CD, where it’s possible to find an aggressive thrash metal with two very singular guitars and full of personality. 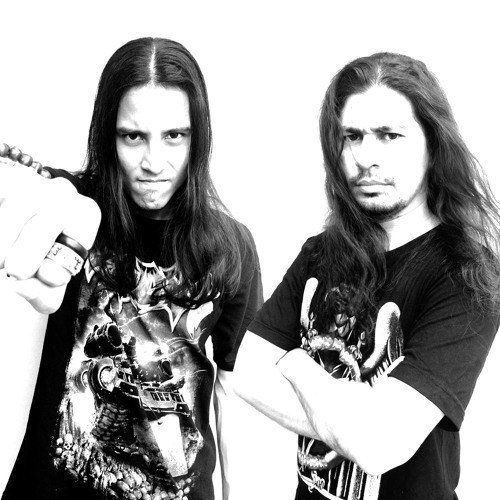 From this, the concept of the band began to be built from the desire of the duo to play where there are people with the same taste for direct thrash metal, simple, fast, aggressive and with elements of death metal. To represent the spirit of the band it was necessary a strong name. At the first moment of the first album creation, the name chosen was Rise Of The Fallen, which was taken from the title of a song by Max Cavalera’s (Cavalera Conspiracy, Ex-Sepultura) Soulfly band, because for LeArzzi the name represented well the moment in which he lived. The name became even more special for the band’s leader when, in contact with his idol’s wife, Gloria Cavalera (Max Cavalera’s wife and Soulfly’s bandmember), received approval to use the name. However, the name had to change because there are already two bands with the same name, one in the USA and another in Europe, besides being a big name and difficult to pronounce in Brazilian territory. Then, with a strong connection between regional and indigenous elements, was decided the band’s name would be Tribuh, a custom name that has its origin in the word ‘tribe’. During the process of finalizing the first album the duo try to complete the band searching for bassists and drummers, however, they found themselves frustrated and unsatisfied in the process. So they made the decision to keep the base of the band focused on the duo and only complete it for shows. Currently, they have two singles released called Psycho Tragedy and Blasphemy. Soon the band will release their first full album, which is already in the final stages to meet the headbangers’s ears.